Teresa was born Anjezë Gonxhe Bojaxhiu in Albania in the year 1910. Her father died when she was not even ten years old. As the youngest child in the family, it's hard to say what kind of impact this had on her but it's never easy to watch a parent die. Anjezë must have felt abandoned and confused. Anjezë had experienced the cold and striking hand of death in her life long before it feels necessary. As must be the case, she moved on with the help of her mother and siblings and was brought up in the embrace of the Church.When she attended services, she would often hear the stories of missionaries and saints and be enamored with the stories. The telling of those stories dug into Anjezë's mind and heart and planted a seed that would bloom many years later. She expressed a feeling that God was calling her to be one of these people. Her story was just beginning and still she sensed that there was a call upon her. She would follow this call at the age of eighteen and leave her home forever. She became a member of the Sisters of Loreto and moved to Calcutta, India, to be a nun and teacher for the poor in Calcutta. Anjezë took her vows in 1931 and took the name Teresa in memory of Thérèse de Lisieux, the matron saint of missionaries. Teresa felt a tension between her calling to help the people of India and their continued suffering. In 1943, famine and disease rampaged through the poor people of Calcutta. In 1946, violence between Hindus and Muslims was escalating and cascading through the populace. Though she had already felt a calling upon her life and had answered it by becoming a nun, she felt another call. She would refer to this as her "call within a call" and it included helping the poor, diseased, andneedy by living among them and providing them care, sustenance, and hospitality. Instead of simply providing for their physical needs, Teresa felt a call to love and embrace the poorest of the poor and treat them as she would like to treat Jesus. The Sisters of Loreto were doing good things by providing education and assistance to the needy--they were living into their call--but Teresa was called further to dwell among the needy and commune with them so that they might know that they were loved and welcome. Life was not easy for Teresa and she often found herself tempted to return to the comparatively easy life of the convent. While begging for food and supplies in the streets of Calcutta, Teresa became a part of the people she had previously been ministering to with some detachment. As Teresa sacrificed her detachment she heard the voice of temptation call to her, "Come now, go back to the good work of the convent. You're beating yourself up for a people who don't care. You've become weak and can no longer help them. Go back to the comfortable life of the convent." Teresa eventually would refuse the siren call of comfort but not without being sorely tempted and challenged. In 1950, her "call within a call" became a reality when a new religious order was founded: the "Missionaries of Charity." There was an abandoned Hindu temple in Calcutta that Teresa noticed one day. She began campaigning with the Indian government to allow her to use it to take care of the needy. Their appreciation of her work with the poor became manifest when they allowed her to convert it and use it. She turned it into the "Khaligat Home for the Dying." This building was a place for poor and needy individuals to come and find comfort and care while they died. There was no charge for their services.Teresa wanted to offer a loving death to anybody regardless of their station or influence. It was not only for Christians but for any religion. Regardless of their religion, they were welcome and provided an honorable and comforting death. Muslims were comforted with the reading of the Quran while Hindus were offered water from the Ganges. Christians were given their last rites and prayed with. The goal was not conversion of the people but, rather, caring for them because of a deep and passionate love. Teresa later would go on to found what she called the "City of Peace." This was a home for people afflicted with Hansen's disease (what we might call leprosy). In this place, those who were outcast and feared were welcomed and loved by people unafraid of them or their suffering. Teresa's heart broke for these people and so she cared for them as best she knew how. Further, her heart was broken for the many orphans in Calcutta and so she founded the"Children's Home of the Immaculate Heart." This was a place for orphans and homeless youth that provided shelter, food, education, and--most importantly--the love that all people feel drawn to. She did more than provide for physical needs but also lived with and loved the outcast so that they might know they were human. The curse of leprosy, poverty, and homelessness is more than simply lack of physical things but also the dehumanization that takes place when society overlooks and fears you. 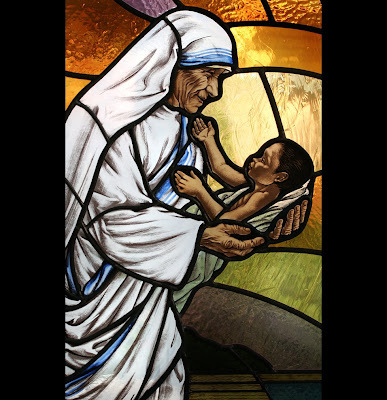 Teresa resisted that tendency by radically loving and welcoming all people--not so that they would convert but so that they might know love more abundant and free. In her lifetime, the Missionaries of Charity would spread to many other countries and throughout India. Teresa had started a wildfire of love that no barriers could stand against. Teresa was not without her own doubts and fears, however. It would be a mistake to suggest that her faith was a matter of doubtless devotion and no fear. Her journals reveal long periods of time when Teresa felt that God was silent to her. She ached and yearned for God's presence and communion in the suffering and heartbroken words of her journal. Even Teresa of Calcutta--the loving provider to millions--went through a "Dark Night of the Soul." Like many Christian saints--St. John of the Cross and Thérèse de Lisieux, for example--Teresa walked through a valley of despair where there was little hope and she seemed to be enveloped by God's silence. She maintained her faith in the face of her doubt and persevered in her calling even when she wondered if it was all a dream. Even when Teresa might not have had faith, her faith still had her. Teresa received the Nobel Peace Prize in 1979. This was only one of many awards that Teresa received for her service and ministry. She received the Nobel prize "...for work undertaken in the struggle to overcome poverty and distress..." She was offered a banquet like all recipients but she refused to attend or even acknowledge it. It was cancelled. She asked that the $192,000 that she was supposed to receive be given to the poor of India. She stated that she had no use for earthly rewards unless it was to help ease the suffering of another. In her speech, she offered sound advice on how peace could be birthed into the world. She suggested that the first act of any peacemaker should be to go and love their family. Further, she identified that the true killer of peace was not physical lack but, rather, emotional lack created by being outcast from society--the most grievous wound for the needy was their own dehumanization. Teresa began experiencing cardiac complications in 1983. When her health worsened, she offered to step down from leading the Missionaries of Charity but she was asked to remain. Her heart continued to weaken and fail while she also contracted malaria. Finally, on September 5th, 1997, Teresa died. She had lived a life of calling (and calling within calling) that led her to pour herself out for others so that they might know life and love more abundantly. She had provided for a loving death to so many people in her own lifetime and provided for her own loving death as she went home to her reward for a life of service and devotion to those whom Jesus said he would be with.